The wife of slain NAVY Seal legend Chris Kyle issued a challenge to the NFL after hundreds of players from different teams took a knee during the National Anthem on Sunday. 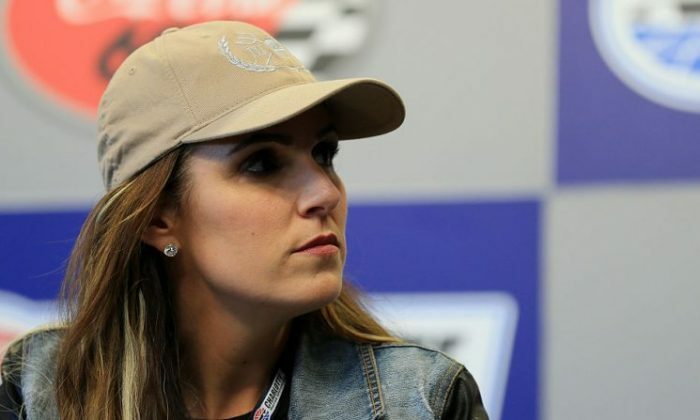 Taya Kyle wrote an emotional letter to the league, affirming her love for the sport and her confusion over the widespread protests by NFL players during the national anthem. The widow is raising two children while working full-time, but also finds time to volunteer for the Chris Kyle Frog Foundation, which is dedicated to “providing experiences that strengthen military and first responder marriages and families,” according to its website. In the letter, Kyle asks why players don’t choose a more productive way to help their communities. Her letter, in its entirety, is below. “You were doing your part to bring people together and heal the world. That’s really how healing works. We heal by loving each other and leading by example; showing people what is possible when we love each other just as we are and not only recognize our differences but celebrate them and look at how we can use them together to make us jointly better than our separate parts. You were doing your part celebrating each other based on skills, talent and a joint vision without regard to color and religion. “You were doing your part and we were doing ours. We showed up cheering and groaning together to [sic] as one. We talked in the concession lines and commiserated and celebrated our team together. Did it ever occur to you that you and we were already a mix of backgrounds, races and religions? We were already living the dream you want, right in front of you. “Your desire to focus on division and anger has shattered what many people loved most about the sport. Football was really a metaphor for our ideal world –different backgrounds, talents, and histories actually made us one big team with one big goal – to do well, to win, TOGETHER. “You are asking us to abandon what we loved about togetherness and make choices of division. Will we stand with you? Will we stand with our flag? What does it mean? What does it mean if we buy a ticket or NFL gear? What does it mean if we don’t? It is the polar opposite of the easy togetherness we once loved in football. “It was simple – we loved you and you loved us – with all of our races, religions and different backgrounds. Simplicity in a crazy world was pretty awesome. “You dear NFL, have taken that. You have lost me here. “If you ever want to get off your knees and get to work on building bridges, let me know. I have found screaming about the problems in service marriages or even standing in silence in front of them, hasn’t healed even one of them. On the other hand, funding the Chris Kyle Frog Foundation, building a team and rolling up my sleeves to get in the trenches during my “off time” -volunteering there outside of my paying jobs – has proven to make real change. “You have a lot of strong guys, I am sure in the off season a lot of them could build some pretty big bridges if they care enough to do the hard work. That would involve getting off their knees and getting to work though. I can do it while I raise two kids as their only parent and work through the greatest pain of my life, let’s see if they can do it for the issues they say they care so much about.